The Fujitsu ScanSnap‘s Automatic Document Feeder is great for taking a stack of documents and ripping through it, but what do you do when the document you want to scan has more pages than the feeder can hold? This is particularly an issue with the ScanSnap S1300, which can only hold 10 sheets at a time. It turns out it’s not a huge problem at all. You just need to make one change to your ScanSnap Manager profile. Right click on the ScanSnap icon in your Dock or System Tray and choose Settings (or Scan Button Settings on Windows). Then go to the Scanning tab. 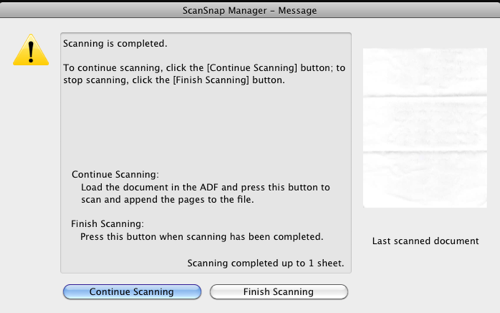 You’ll see a checkbox that says Continue scanning after current scan is finished. Check that and hit Apply. Now, when you stack of documents in the feeder and hit the scan button, after it finishes it will prompt you to add more pages. If you’re done the document, hit Finish Scanning. Otherwise, add more pages into the feeder and hit Continue Scanning. If you scan a lot of large documents, it may be worth your while to create a special ScanSnap Manager profile just for this. Otherwise, you can just change the setting when you need it (or leave it checked all the time if you don’t mind the Finished Scanning box coming up every time).